The mid-roof sleeper features a liftable lower bunk and upper storage units on the sleeper's back wall, including hanging storage for drivers to hang their clothes and jackets, or an optional upper bunk for driving teams. A bunk heater, flat screen TV and premium sound system can also be added. KIRKLAND, Wash. — Kenworth’s T680 is now available with a 52-inch mid-roof sleeper. Kenworth officials say the sleeper is well-suited for regional hauling applications – including tank, bulk, flatbed, heavy haul and lowboy – where drivers may spend just two or three nights on the road during a typical week. The sleeper offers up to about 600 lbs in weight savings compared to the 76-inch sleeper available with the T680. The T680 with 52-inch sleeper includes a stamped aluminums cab, panoramic windshield, “robust” door, three-piece aerodynamic hood, and “high quality” dash and interior, according to Kenworth officials. The company says the interior boasts excellent height for a mid-roof sleeper, allowing a driver or passenger up to 6”4 to “easily” stand up between the seats. Optional passenger swivel seat also expands the living space into the cab for the drivers when parked. 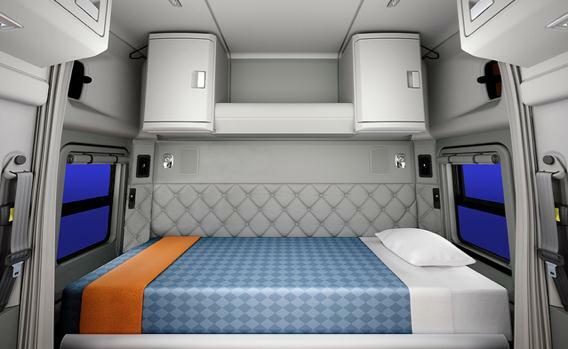 The mid-roof sleeper also features a liftable lower bunk and upper storage units on the sleeper’s back wall, including space for drivers to hang their clothes and jackets, or an optional upper bunk for driving teams. A bunk heater, flat screen TV, premium sound system and factory-installed inverter with optional shore power are also available. “With the latest addition, Kenworth now offers the fuel-efficient Kenworth T680 in a day cab, 52-inch sleeper and 76-inch sleeper configuration, which gives more truck operators the opportunity to benefit from the T680’s superior fuel efficiency, outstanding performance, exceptional styling and extraordinary comfort,” said Erik Johnson, Kenworth on-highway marketing manager.